So since the last dance diary entry several weeks ago, Level 2 of the absolute beginner workshop wrapped up at LINES. After the first few meetings I was starting to feel like the class was in a slow rut, but past the midway point the pace picked up nicely. Not only that but in the last two classes we’ve had live piano accompaniment, which is quite blissful. At the final class this past Sunday I had some encouraging chats with a couple of the other students and the teacher about what to take next. It turns out that our teacher might not be teaching Level 3 until early next year, so in the meantime I’ll go to drop-in classes and may branch out and check out other schools in the city as well. She mentioned an advanced beginning class at ODC, which I had thought I might not be ready for, but she said that I had been dancing well in class and to check it out. Yay for confidence! By the way I’m going to be on vacation in Anaheim starting tomorrow, so I’m going to try and carve out some time while we’re there to take a class at Anaheim Ballet. 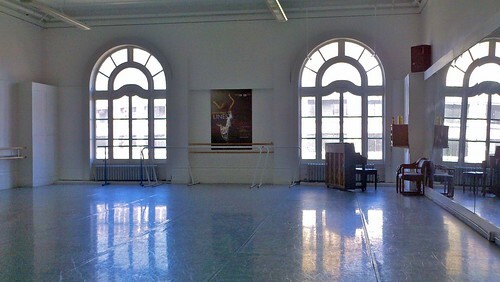 I’m totally excited about the idea of taking ballet class wherever I am, even on vacation. I bought some new shoes. Thanks to Endless’s free shipping and free return shipping, I just ordered a few pairs in a range of sizes, kept the ones that fit, and returned the ones that didn’t. I ended up getting a pair of Sansha Pro 1 in black canvas. The Capezios I used previously were just a little too big. They were the smallest size in their men’s line (yes, I have relatively small feet, for a guy) so I needed to go unisex. So far, so good. With my new Under Armour compression shirts (which are kind of flattering if I do say so myself; my workouts during the week are paying off), the dance belt, the tights, the shoes… I am looking very much the real deal. Last week I saw a concert by Man Dance Company, an LGBT-focused dance company in San Francisco. This was my first time seeing them, and they seem like a good group of talented dancers. And let’s face it, you just don’t see male couples a lot in ballet or in mainstream dance for that matter, so their dances are kind of refreshing. The highlight for me was several pieces set to songs inspired by Brokeback Mountain . Singer Ryan Harrison and composer Shawn Kirchner were there to perform the songs live. I’d heard a couple of these songs at the San Francisco Gay Men’s Chorus concert earlier this year and really liked them. So it was neat to see them danced to. Not much to report on the class front: so far, so good. My July 10 class was my tenth consecutive class, yay. So it’s funny (but probably not surprising) how sometimes steps that you can do with no problem in one direction are another story in the other direction. Last class (July 17), my teacher combined two steps we’ve been doing (polonaise, I think that’s what it’s called but I still haven’t confirmed, and balancé). Going to the right (diagonally downstage right), no problem. Going to the left–even though these are basically the same steps, just in reverse order–I was all awkward limbs everywhere. Kind of amusing. Ah well, something to work on. Universal Ballet, based in Seoul, is on tour in San Francisco right now, and I went to see them last night at the Opera House. (I hadn’t heard any buzz about it beforehand, but $30 center orchestra seats from Goldstar made it hard to pass up.) The program was Shim Chung: The Blindman’s Daughter , a three-act story set in ancient Korea. For some reason going in I was afraid it might be a bit heavy-handed or cheesy, but overall it really is enchanting. (I will try to forgive the improbable, deliriously happy ending. Improbable, even given the already fantasy-laden story.) The dancing is entertaining, and the sets and costumes are impressive, especially in the underwater kingdom scene. Shim Chung plays again in San Francisco on Sunday afternoon, July 24, then the tour continues in Vancouver. 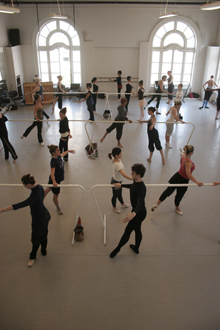 Last time, I mentioned how my beginner ballet workshop is quite large (about twenty-five people). Well, at our June 26 class we got moved to the studio down the hall, one of the larger studios with tall windows facing Market Street. Our previous studio was fine, just as tall, but there’s so much more room and light here that the former crowdedness doesn’t feel like an issue at all anymore. How can you not be inspired with windows like this? That Sunday happened to be on Pride weekend, so that means the parade! 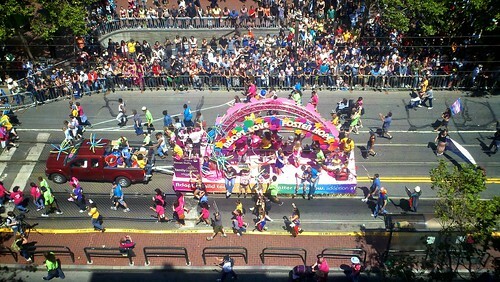 It was a perfect view of the parade route and the festival in front of City Hall. Though we had to contend with some music and crowd noise from outside, I didn’t mind. It actually made the class feel more energized to me, like, here we are in a big city. Fame! So class was good. 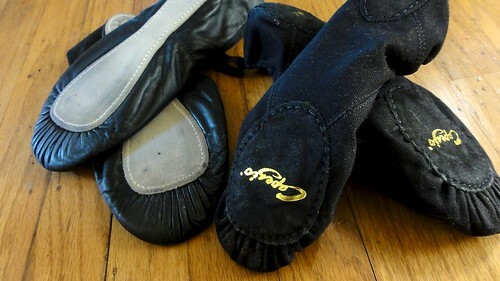 A few new steps and terms: en cloche (literally, “bell”: as applied to a dégagé or battement for example, moving front and back, passing through first position), glissade (sliding step), and various body/arm positions (croisé, effacé, etc.). Here are some glissades, first simply then with additional jumps (umm, yeah, we didn’t attempt those), from the Royal Ballet’s glossary. The workshop didn’t meet the next week (July 3) due to the holiday weekend, and though I was tempted to just take a break that day, I went to the open intro class that I’ve been to a couple times before. I like how these two classes sort of complement each other. The beginner workshop lays down the basics, and the intro class steps it up a notch. There are more combinations and jumps. A new one I learned last week is ballonné (I hope I have that right), which basically starts in cou-de-pied, then as you hop, the working leg extends out then comes back in as you land. We saw Billy Elliot in San Francisco last week. We’d seen the London production a few years ago while on vacation, and it was great to see the show again and be reminded of how amazing the dancing is. The boys who play Billy are so talented. 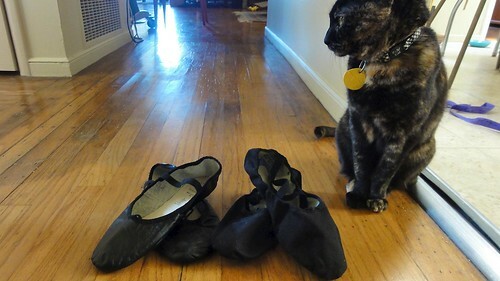 There is a lot of ballet of course, but also a lot of tap. (I kept thinking, “Hmm, I’d love to learn tap!”) I’m really tempted to see the show yet again before it leaves town in September. A while back I subscribed to Dance and Pointe magazines, and they’ve started to arrive in the mail. It’s pretty cool, but I will say that, like much of the ballet world, they’re still mostly oriented towards girls and women. I did appreciate the “Next Guys of ABT” feature in the June/July Pointe . Bournonville, who is said to have been a superb dancer, emphasized male technique. In his ballets, the men’s steps–beats, air turns, flying jumps, turning jumps–are every bit as hard and as serious as the women’s. 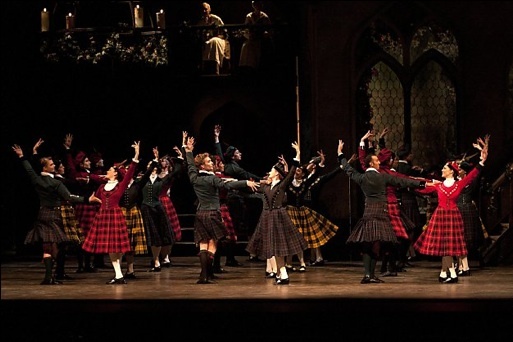 In “La Sylphide,” the men do them in kilts, so that we get to see the hardworking thighs. I think all male ballet dancers should perform in kilts. Amen, sister. (The YouTube clips I came across of the RDB’s La Sylphide aren’t very clear, so instead here’s an early ’90s Alexei Ratmansky as James, though I’m not sure which company this is.) Work that kilt! After Beginner Workshop 1 ended, for two Sundays (June 5 and 12) I went to an intro ballet class suggested by my workshop teacher, and it was nice to change things up with a different teacher and slightly different skill level. This is an open class, so the pace is a bit faster, both in terms of the whole class and each individual exercise. Like, we were rond de jambe-ing like nobody’s business. And we got to do more across-the-floor exercises, including a fun one where we got in small groups, linked arms in a line, and did battements (so basically Swan Lake meets the Rockettes). Last Sunday (June 19) I started Beginner Workshop 2. Nothing really new, but it was good to see our teacher, back from her trip to Russia. The only thing is the class is kind of large… and I may have contributed to that by trying to register after it was already full, at which point they agreed to up the capacity from twenty to twenty-five students. So, good for me that I got in, but it does feel more crowded than the previous session. Ah well, I know I just have to make the most of it: stake out my mirror and barre space, ask questions as needed, and basically not get lost. Recently I bought a dance belt and tights, and finally tried them on. Not bad, but I haven’t worn them to class yet. The dance center doesn’t have a dress code, so I’m not required to wear tights, but there is something about them, like they’re the uniform for classical ballet, that gives you a feeling of purpose. As in, suit up and dance! So maybe I’ll wear them to next class. We shall see.